It would not be an exaggeration to say that Turkey is holding its breath as Kurdistan Workers’ Party (PKK) rebels started their withdrawal to Iraqi soil. From every vantage point of view, this is the third phase of the “peace process” following Prime Minister Recep Tayyip Erdoğan’s declaration of the talks and PKK leader Abdullah Öcalan’s call for an “honorable” farewell to arms. Thus, a timetable agreed upon months ago by a “long-distance handshake” between these two figures has been holding up, emphasizing the historic significance of the process.In the midst of all the buzz and noise, the pace of reform and reconciliation is bound to be forced. Those who from the very beginning believed that the deeper the process, the more irreversible it would be are feeling more confident by the day. But holding one’s breath has many dimensions. The withdrawal, until now by only a tiny group of rebels — the number given by a Kurdish colleague with the Yeni Şafak daily, Çetiner Çetin, is 53 — is taking place under a blanket of hope, doubt and concern. It is expected that all the PKK rebels — 2,194 according to Ankara’s figures — will have completed their withdrawal between Aug. 15 (the 29th anniversary of the first-ever PKK attack on a Turkish army post) and Sept. 21, the International Day of Peace. First, the hope is that the withdrawal will not be derailed by provocations or second thoughts. Second, for Erdoğan and the Justice and Development Party (AKP), its timetable tightens the room for maneuvering for long-overdue major reforms — a new constitution. Third, even if the pullout goes ahead with no “accidents,” there are still viewpoints out there — comprising both the majority Turks and minority Kurds — that need reassurance from this or that vantage point. The first point is obvious. The second point, on the other hand, is intertwined with the third because how Erdoğan and his powerful government navigate the completion of the settlement process and the delivery of the massive reforms is tied to how Turkey as a whole “digests” what is going on. The 63-member wise people delegation presented its reports from seven geographic regions to Erdoğan earlier this week. Their overall message conveys a cautiously positive mood, albeit with a number of question marks. Support for the process among Kurds — in the poverty and fear-stricken East — is around 90 percent, they assessed. Those who mainly met with Turks also sound optimistic, claiming support of around 70 percent. Yet, the more important part is the questions they have gathered from their often tumultuous — sabotaged or filibustered — meetings. Some of the questions people are asking include: Will we be free of fear that our sons will be killed when they are sent into combat? Will there be education in one’s mother tongue when terrorism is over? Will education in Kurdish not split up the country? 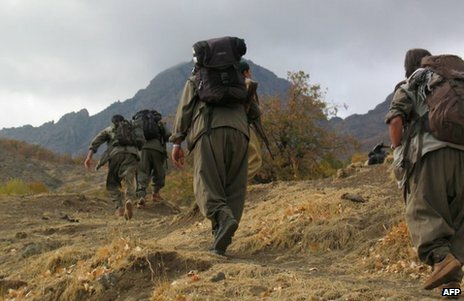 What exactly has the PKK agreed to lay down its arms in exchange for? Will Öcalan be moved to a form of house arrest? Will Turkey be ruled as a federation? Will the Turkish identity be wiped out of the constitution? Will we have a presidential system at the end of the process? And so son. Recent polls seem to confirm the support and anxiety. Two of them, so far not made public, roughly tell us this: According to the first poll, national support for the process only recently passed the 50-percent mark. Support for the AKP still remains above the 50-percent mark as well. The main opposition Republican People’s Party (CHP) has lost some support and is now down to 20 percent. Support for the pro-Kurdish Peace and Democracy Party (BDP) has increased slightly to 7.5 percent. The real winner so far, it seems, is the extreme-right Nationalist Movement Party (MHP), which currently receives support of 14 percent according to one poll, and 15.2 percent according to another. Let me also add that a recent large poll in İstanbul shows a support of 70 percent “for a peaceful solution” (vis-à-vis a military one), while “solving it by negotiating with Öcalan” is backed only by a one-third of respondents. So, the more irreversible the process, yes, but the trickier as well. If it were only about a simple withdrawal, it would be a winner. But now comes the phase of political reform, which the “nyet” sayer opposition hungrily awaits. From now on we will have to watch how skillful — or not — the government will have to be to take it to a happy ending for all.